Anyone wishing to donate articles for our next Auction in Spring 2018 - it is not too soon!! 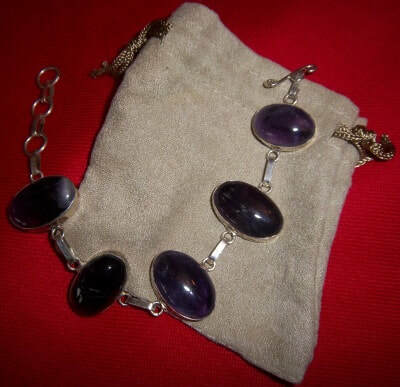 This beautiful bracelet has 5 large (1” X ½”) oval purple stones (translucent when held to the light) linked together in silver metal (possibly sterling???) The closure is bar and circle for ease in putting on and taking off. Overall length is 8”, with 3 circle links at one end to adjust size to your wrist. The bracelet comes with a little tan bag for storing. This is a handmade pendant of twisted silver wire on a silver metal ring with lovely clear crystal chunks interwoven. The pendant measures approx. 1 ¼” diameter with a graceful tear drop shaped loop to add a cord or chain. This piece was handmade by the donor. This is modern Egyptian theme painting on papyrus, signed by artist. The “canvas” measures approx. 12” X 17” and suitable for framing. This item will be mailed between heavy cardboard for protection. Here we have a beautiful purple on purple blouse / top, new with tags, a product of Holy Clothing. This is a size large measuring 29” long X 21” wide (lying flat) = 42” circumference. The top has ties in the back as well has ties in the front, likely to adjust sizing. Here we have a white handled Athame with a decaled heavy plastic handle and sheath. Overall length is 12” (blade approx. 6 ¾” to gold metal hilt) and has served as a ritual tool by the owner previously [used]. There is a place on the sheath front and back near the tip that may have contained a crystal or such and could be replaced. Cleanse and charge under a full moon to make it your own. Atlantis: lessons From The Lost Continent by J. Allan Danelek – A Modern Look At A Prehistoric Civilization. Join the author on a compelling journey of discovery as he attempts to answer questions surrounding the controversial twelve-thousand-year-old legend: Was Atlantis a real place or did Plato invent the story? If it did exist, what could have led to the widespread destruction of an entire continent? And are we heading down the same road to self-annihilation? This softcover book is new ($15.95) in excellent condition. This is a beautiful silver metal frame encrusted with white pearls, approx. 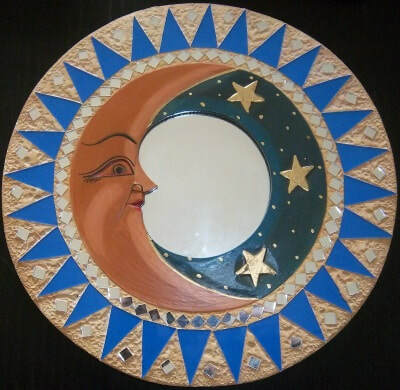 11 ¾” diameter plaque with a mirror inset. The frame is embellished with small mirror tiles and glass triangles creating a radiant design. The background tan color is textured creating a moonscape type appearance. At the center the moon and stars complete this look. A great piece for your altar or meditation space. Lucky Brand silver dangle earrings are approx. 3” long with a chevron design made up of 11 straight silver metal pieces suspended trapeze like from a matching silver metal chain link. These earrings are new on original card ($35.00), and come in a giftbox. 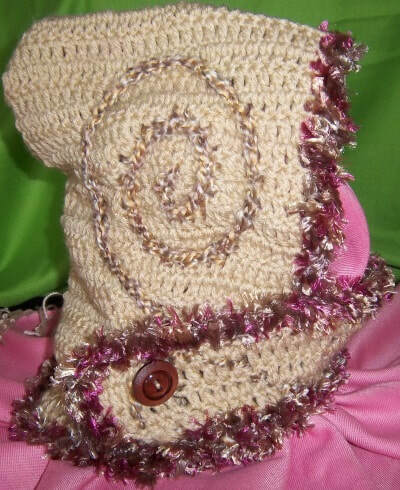 This is a hand crocheted hood made by Anastasia in tan with the outer edges and spirals in earthy fall colors. The bottom edge of the hood extends around under the neck with a button closure. This would surely keep you warm from the harsh cold and winds for those who live in cold winter climates. The picture does not do the hood justice. Rune inscribed iridescent glass stones in a rustic burlap bag. This is a complete set of 24 in a very nice size. Each glass stone measures approx. 1 1/4” diameter. Whether you are looking for a new set to add to your collection, or wanting to start working with runes, here is the chance to meet your plan. Here we have Ladies XL Polo Shirt in a medium blue, with the Tradition’s Correllium. A CNT fashion statement, great for meet-ups, public rituals and anyplace to share your membership. This shirt is new, no tags. Guys, check out the neck opening, maybe it would work for you as well. This is an unlined hooded cloak / cape in a black medium weight velveteen fabric. This is termed an adult one size fits all and you can see from the pictures there is much material. The hood is attached and there are 2 straps in the same material to tie around your neck. This is new sealed in a plastic bag, The photo is of a similar blue cape, from last April’s Silent Auction. Add this to your ritual apparel to wear in circle. Model 5’ 6” tall is still not included nor is the dog. 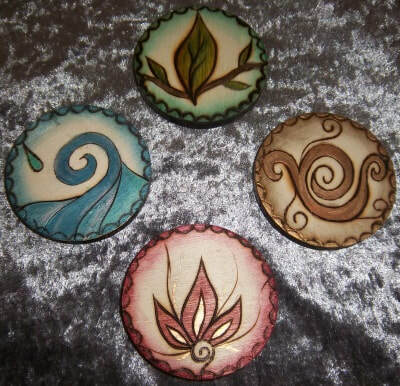 This is a set of 4 wood discs / tiles hand-painted by the artist depicting the 4 elements. The graphic outlines are made by wood-burning and then embellished in attractive color stains. Each tile measures 2 ½” diameter and lightweight so they can easily be added to your home altar and / or traveling altar. Mythical Fantasies Cross Stich Booklet by Stoney Creek. This booklet #292 includes patterns and a color conversion chart for 6 projects: Unicorn and fairy magic, Dragon, Wizard, Princess, Castle and Knight. Enough plans here to keep you very busy for many months (or years). The booklet is a little shelf worn, but still in great condition. 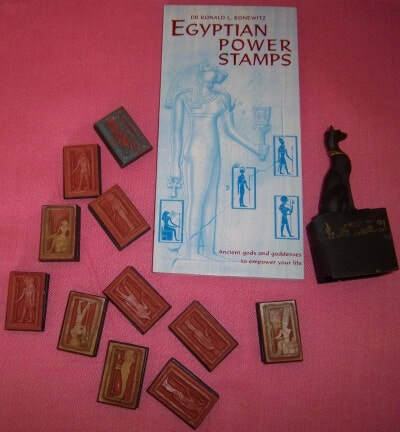 This set of Egyptian theme rubber stamps has 11 changeable tiles that are inserted into the Bast holder for stamping. Included with this set of rubber stamps is a booklet, written by Dr. Ronald L. Bonewitz with details and correspondences when using the various designs, along with a brief How To. Note, the set originally had 12 stamp tiles, but one went missing and there is some damage to the Bast Stamper that does not affect the insertion of the magnetized tiles. Previously used. 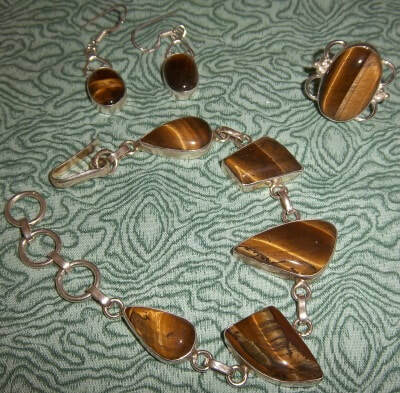 Here we have a 3-piece matching ensemble of what appears to be tigers eye Set in white / silver metal. The bracelet measures approx. 7” with multiple links to size to your wrist. The dangle earrings are for pierced ears and the ring is not adjustable, but appears to be a size suitable for the larger fingers of a hand? 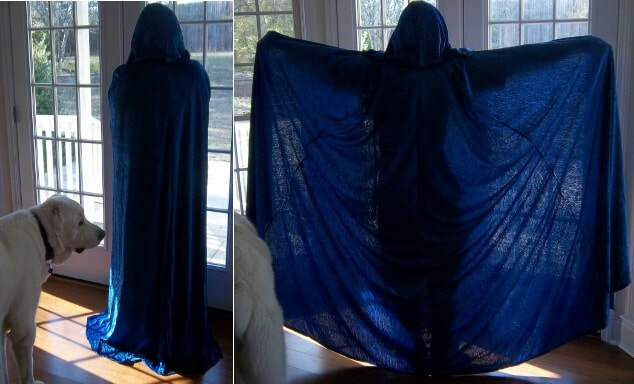 This cloak is similar to the one pictured in item 19 but in a child’s size. The Red velveteen is unlined, lightweight and ready for a child in time for Samhain / Halloween festivities, or ongoing ritual wear. Item is new in a sealed bag. Truly a unique design for this pendent. The image is of a tree intermixed with the Ying / Yang symbol in contrasting colors of green and black. A very earthy and appealing design, set under glass with silver metal trim and a 20” chain. This item is new. This is an oval wood plaque measuring 8” x 10” that has had many astrological symbols wood-burned around the outer edges with a directional compass in the center surrounded by stylized sunrays, along with random stars. The plaque has been finished with a coat of polyurethane or similar sealant. The Water Drum slowly drops beads through holes inside the bamboo shaft giving off a soft pleasant sound to add a nice effect to a drum circle a meditation, or chanting. Nicely decorated with various symbols and has a hoop holder at one end for storing. The drum shaft measures approx. 23 ¾” Long X 2” Diameter. We are fortunate to have another creation by this artist who has taken a standard book type journal and turned it into a 3 dimensional piece of art. This hardback journal has been recovered in a yellow / gold textured finish and Cat Goddess modeled and painted onto the front. The journal is 5 ½ “ X 8 ½” x 7/8” thick plus the added Cat Goddess adding another 3/8” to the thickness at the highest point. This is an item calling out to become an heirloom filled with your writings. This is a framed and matted Picture titled: “Magic Beneath the Mushrooms”. The black metal frame with hinged leg for surface placement also has a loop for wall measures 7 / ¾” X 5 ¾” Outside dimension, with the matted picture being 5 ½” X 3 ½”. A beautiful assortment of over 25 tumbled / polished stones. These would be perfect for those creating a medicine wheel, for placement on your altar and a host of other uses. Many colors and shapes ready for your collection. A unique locket style aromatherapy necklace, so you can now wear your favorite essential oils anywhere. The silver metal locket has a cut-out of a “stag” that opens to insert one of the assorted trim able discs that can be sized to this and other lockets as well. The hinged pendant is approx. 1” diameter and comes with a delicate 22” chain, with lobster claw closure. This is new / unused and comes with the assorted discs pictured. 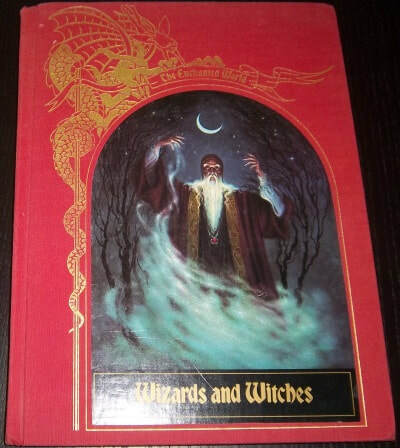 Wizards and Witches – The Enchanted World by Brendan Lehane is an oversized hardcover book from the Time-Life Series. The Book is divided into 3 chapters: Singers at the World’s Dawn, Masters of Forbidden Arts and The Shadowy Sisterhood. This 9’ X 12’ book has 140+ pages, loaded with colorful illustrations with some minor edge wear and scuff stains on back binding. This is a modern pocket watch in antique bronze finish with a reticulated pentagram and sunburst on the front lid. Push the top button to reveal the Arabic numbered clock face. The second hand of this battery operated watch is rotating as I write this. The watch is approx. 1 ¾” diameter with a 32” matching antique brass finish chain. The rear of the watch has a very nice etched design. 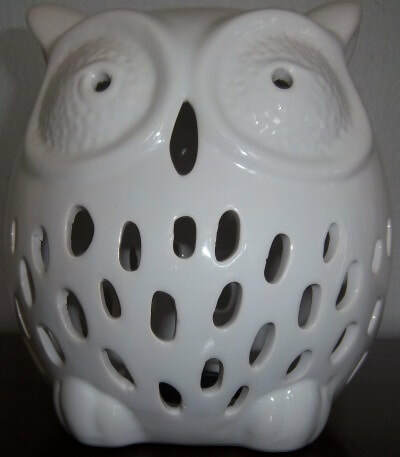 This is a white ceramic sculpture of a half shell, fashioned to hold a tea light or votive by Partylite. The shell measures approx. 6 ¼” W X 4 ¼” H X 3’ D. Bring the power of the ocean creatures to you altar and or meditation place. Used, but in like new condition. 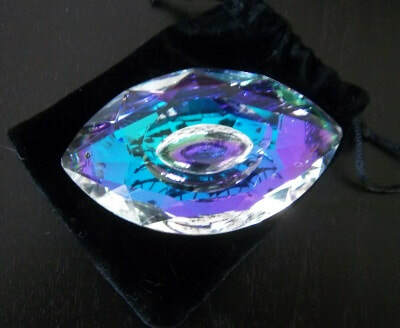 What we have here is an awesome faceted lead crystal piece in the shape of an eye!!! When held in your hand it reflects purple blue iridescent colors just like in the photo. Imagine a ritual or meditation with this in your hand – Power!! This is a fabulous item for the altar or any special place for magical workings. The crystal measures approx. 3” X 1 1/2” and will come in a small velveteen bag. This is an approx. 3 oz. 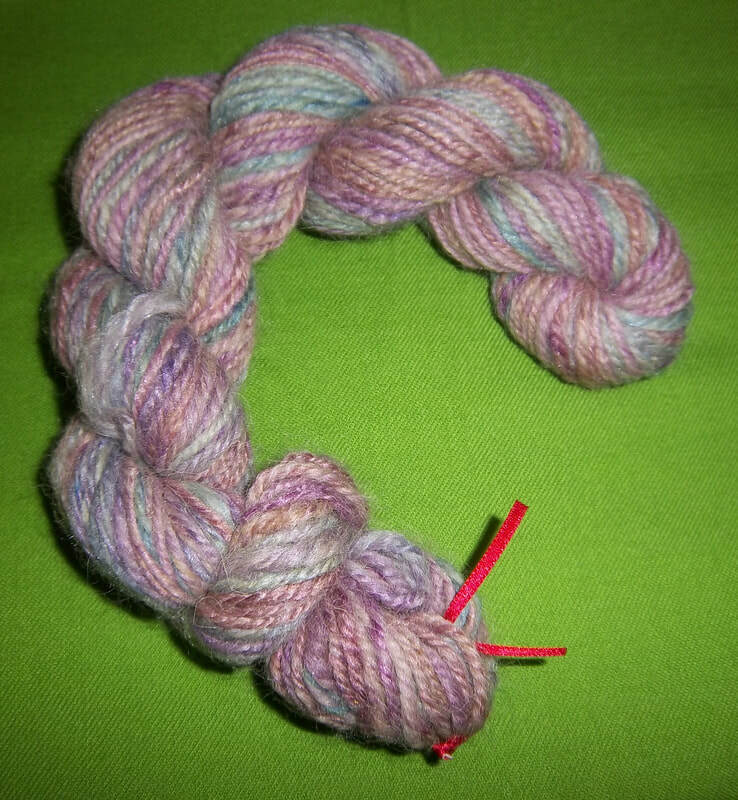 skein of hand spun by the donor of blended silk and merino wool 3-ply yarn. The yarn is a rainbow of muted colors and needs to be made into something special with all that infused energy by Ana. The Celtic Book of Seasonal Meditations – Celebrate the Traditions of the Ancient Celts by Claire Hamilton. The name Celt comes from the Greek Keltoi, meaning “the Mysterious Ones”. The Greeks gave them the name because they considered them a strange and mysterious people, as did the Romans. This was because the Celtic attitude to life was alien to theirs in at least three fundamental areas. They were a matriarchal society, they had a great reverence for the earth, and they believed in the close proximity of the spirit world. This book is a practical celebration of the ancient Celts and their spirituality and can be used for the individual or a group. 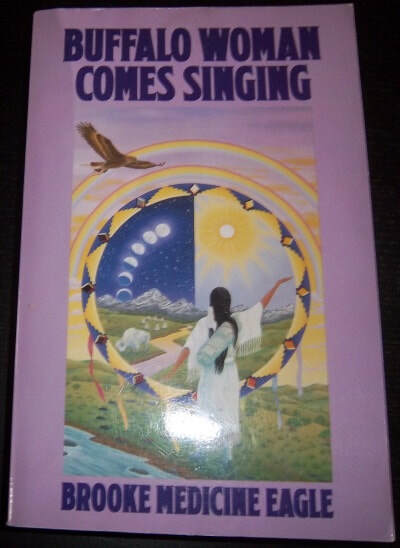 This small hard cover book ($21.95) with dust jacket is in excellent, like new condition. Here we have a pair of nice size crystals with much clarity. The larger one is 3’ long and the second one is 2 ½’. These are wonderful pieces to have for the altar, casting a circle or calling the quarters. Have plans to craft a wand or a staff, these are nice and bulky for that purpose. This is an Obsidian Ball on a cord and great for Divination for Ancestors on Samhain. The ball is approx. 5/8” round and drilled to thread to the black cord. The black cord has a unique slip knot to shorten / lengthen by the wearer. This Wheel of the Year Pendant is a ceramic disc mounted into a silver metal ring. 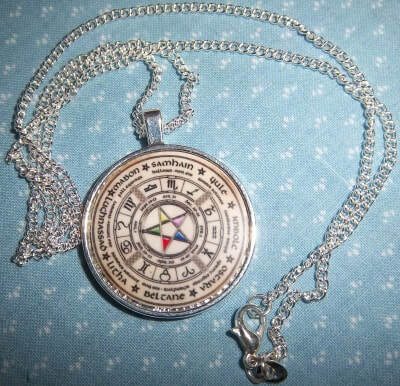 The outer circumference has the Sabbats, with an inner ring of astrological signs, and another ring with the Sabbat dates, culminating with a pentacle in the center. The pendant measures 1 1/8” diameter and comes with an 18” fine link chain. This piece is flat enough to be mailed regular envelope, a plus for our International bidders. 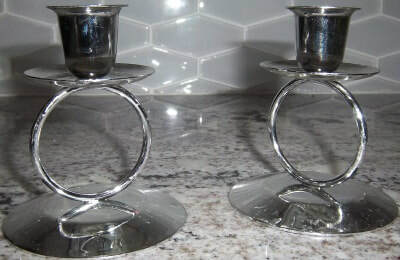 This is a pair of taper candle holders in a glossy chromed metal. The candle holder with drip plates sit atop a metal ring giving this pair a light airy look. The matching pair is 3 3/8” H on a 3” diameter round base. Candle holders are used in great condition.